Welcome to Alsace and its distinct – and distinctly underrated – wines. I’ve been living here in this beautiful region on France’s eastern edge, sandwiched between the Rhine and the Vosges mountains, for more than 30 years now: time enough to acquire a taste for its superbly complex wines, fine food and improbably beautiful scenery. I’ve written two books about the region: the first was A Taste of Alsace published by Pavilion in the UK, William Morrow in the US, Flammarion in French, someone else in German and an edition in Danish – all, sadly, out of print, but there’s a brisk secondhand market on the internet. The second was Alsace Gastronomique, published by Conran Octopus in the UK with a French co-edition by Hatier, also out of print but available on the internet. I also collaborated with Guy Jacquemont on Le Grand Livre des Vins d’Alsace, that one published by Chene in Paris. My articles on wine travel appear in the UK wine magazine Decanter and on Zester Daily, as well as on my sister food/wine/travel site. I contribute the Alsace sections for Wine Travel Guides, and my sporadic updates form the meat (and drink) of these pages (see Recent Posts). I constructed and gave a webinar on matching Alsace wines with food for the French Wine Society’s Alsace Master-Level Program. As often as possible I leg it up into the vineyards to look in on favourite winegrowers and meet new ones, walk the sentiers viticoles, pick wild mâche (aka lamb’s lettuce) and take pictures. Sounds interesting? Like to come along? Please join me for one of my bespoke vineyard tours, designed for anyone wishing to deepen their knowledge of these exceptional wines and to meet their producers. 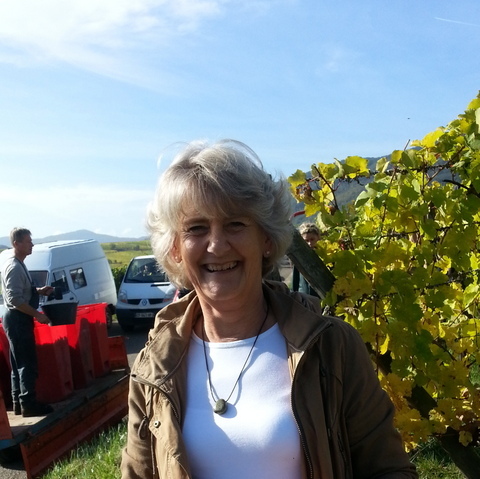 For more details, check out my Alsace Vineyard Tours page here. A bientôt en Alsace! See you soon in Alsace!